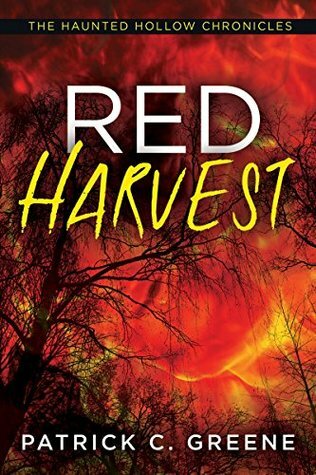 Red Harvest by Patrick C. Greene seems to be the first book in the Haunted Hollow Chronicles. This one is a horror story set in a small town right at the Halloween season so with Halloween coming up I thought it would be a perfect read to get into the fall mood, however I wasn’t quite the fan I thought I would be. Red Harvest takes place in the small town of Ember Hollow that lives for the Halloween season and goes all out on the activities every year. From the multitude of jack o lanterns, the pumpkin parade to the devil’s night celebration the town is known as the place to be to celebrate. This Halloween however things in Ember Hollow are a bit creepier than normal and the citizens find themselves battling to figure out what is real and what is imaginary. With dark and disturbing visions haunting them are they losing their minds or is something evil in the town? Alright, obviously this is another book that just wasn’t for me. It started off alright enough bringing on the creepy vibe very early on however once getting really into the story it fell apart a bit. I struggled with whether I thought the author brought a bit too many characters or too many situations in or perhaps a bit of both but I found it hard to follow and began to lose interest. In my mind there’s some good ideas but as a whole this one felt a bit like mashing up a short story collection and trying to make one book out of many so sadly I wasn’t a fan. In addition to his novels PROGENY and CRIMSON CALLING, the short story collection DARK DESTINIES, and multiple appearances in both The Endlands and Wrapped anthology series, Greene has several FILM projects in the works, and is currently working on his third novel, apocalyptic action-thriller – UNDER WICKED SKY. Nice honest review Carrie. Too bad it was too busy to keep up with. It sounded like it would be a great fall horror. Better luck next book.